The iKlip Studio holds the iPad firmly on desks or other surfaces without sliding. 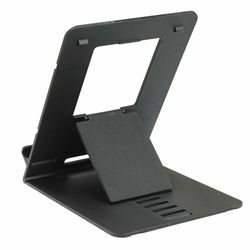 Adjust it to hold your iPad in a vertical or horizontal position, or fold it flat for portability. Constructed of durable thermoplastic, the iKlip Studio is nevertheless lightweight and easy to use. Fits all 9.7-inch iPad models, not included.